Breloom in game: 737 Who? Important notice! Pokemon Breloom is a fictional character of humans. 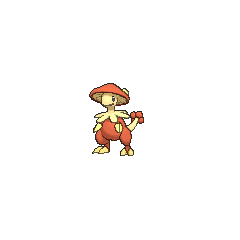 The first major role Breloom had was in A Shroomish Skirmish. Ash and his friends were being attacked by Breloom that had evolved from Shroomish and were mad at Team Rocket for stealing their food. May's newly evolved Combusken took on the leader Breloom in a vicious hand-to-hand fight and suddenly declared a truce between them, saving the day. Kenny has a Breloom that first appeared in Journey to the Unown!, where it was used in battle against Ash's Turtwig. In Team Shocker!, its performance in the Appeals Round of the Solaceon Town Pokémon Contest advanced Kenny to the Contest Battles. A wild male Breloom who was in love with an Orange Flower Floette appeared in A Windswept Encounter! with 3 Beedrill followers. He fought against Noibat over the Floette who didn't reciprocate his feelings, but later worked together with Noibat to defeat Team Rocket. 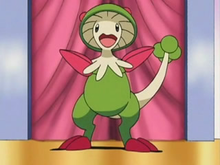 Breloom's first appearance was a cameo in the first Advanced Generation series movie, Jirachi: Wish Maker. The Mushroom Pokémon was one of the residents of Forina, Jirachi's home. A Breloom made an appearance by the beginning of Where's Armaldo?. Breloom had another cameo in Numero Uno Articuno as a Pokémon belonging to Noland. A Breloom briefly appeared in May, We Harley Drew'd Ya! under the ownership of an unknown Coordinator. A Breloom was battled by Ash and Pikachu during the tournament in Lucario and the Mystery of Mew. Some Breloom made a cameo in the opening to Giratina and the Sky Warrior. Breloom appeared in Zoroark: Master of Illusions as a few of the many local Pokémon who lives in Crown City. Two Breloom worked with the other Pokémon in surrounding Zorua to attack him, angry at Zorua for what Zoroark did to the city. Before a fight broke out, the Breloom, along with the other Pokémon, were calmed by Celebi. A group of Breloom also appeared in Genesect and the Legend Awakened battling the Genesect Army at Pokémon Hills. AG082 Breloom May's Pokédex Breloom, the Mushroom Pokémon. 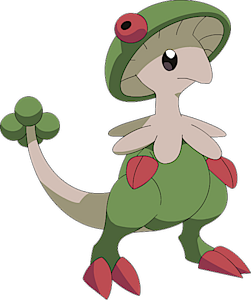 Breloom is the evolved form of Shroomish. Its excellent footwork gets it within striking distance of its opponent where it unleashes a barrage of punches. XY104 Breloom Serena's Pokédex Breloom, the Mushroom Pokémon. 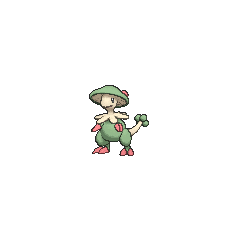 Breloom releases poisonous spores to weaken its opponents. Then, attacks with powerful punches. A wild Breloom appeared in The Cavern, where it was running away from a storm which a Primal Kyogre was involved. Breloom made its debut in Brushing Past Breloom where a wild one attacked Norman, only to be quickly beaten unconscious by his Vigoroth's Aerial Ace. 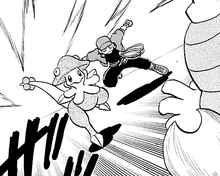 It also made a brief appearance in Verily Vanquishing Vileplume II under the ownership of Pokémon Ranger Masaharu. However, it was no match for Emerald's Dusclops. 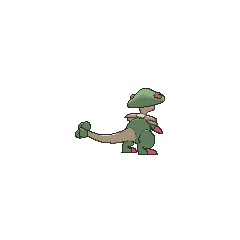 Breloom closes in on its foe with light and sprightly footwork, then throws punches with its stretchy arms. This Pokémon’s fighting technique puts boxers to shame. 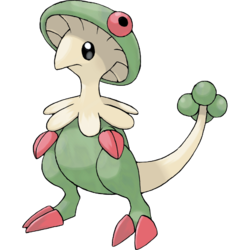 The seeds ringing Breloom’s tail are made of hardened toxic spores. It is horrible to eat the seeds. Just taking a bite of this Pokémon’s seed will cause your stomach to rumble. Breloom is based on a mushroom specifically the genus Agaricus and its body structure resembles that of a kangaroo. The shapes of its head and tail resemble that of the armored dinosaurs, Pachycephalosaurus and Ankylosaurus, respectively. Kinogassa may be a combination of 茸 kinoko (mushroom) and 傘 kasa (umbrella).